Marbella is a city based in Andalucia Region, South Part of Spain. Since the city is part of so-called Costa del Sol region of Andalucia, Marbella offers amazing beaches and sun almost throughout an entire year. As a result, the city is considered as one of the most important and most popular resorts in the south of Spain. Sounds good? Check out our suggestions on where to go and what to see while in Marbella. Marbella as a city is considered as a glamorous resort where the rich people celebrities, foreign residents are living or spending their free time. The old town it has its own very unique image. Small, narrow streets together with hidden little squares filled with flowers make the magical impression about Marbella. One of the most famous squares which you cannot miss while in Marbella is so-called Plaza de Los Naranjos (Square of Oranges). The square got its name due to the bunch of orange trees planted there. Oranges fill the square with the orange color during the spring and surround the place with a very pleasant natural smell. Other places worth to visit are: churches of Marbella called Ermita del Santo Cristo de Marbella and Ermita de Santiago and much more. Just outside the old town, there is Represa Park located which during the summer offers very nice walking path. In addition to this in the middle of the park, there is Museum of Bonsai. If you haven’t seen anything similar we would highly recommend to visit it. For those who are shopping lovers, Marbella offers a variety of shops which will definitely satisfy even the pickiest shopper. The old town is full of small little shops, art galleries, boutiques allowing you to buy unique high-quality handmade clothes, decorations, souvenirs, accessories. 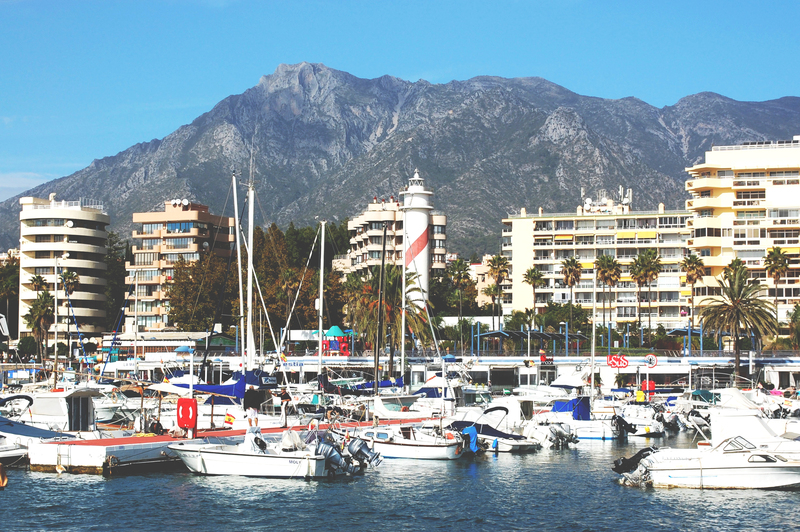 For those who are more into the ongoing trends and contemporary fashions, Puerto Banus (Port of Banus) is your place to go. Top international designers stores such as Dolce & Gabbana, Loewe, Gucci, Ermenegildo Zegna, Philipp Plein, Bulgari, Tods, Missoni, Jimmy Choo to mention few are for your deposition. Marbella provides you with 26 kilometers of coastline full of a variety of beaches. Some are a little bit more private and you could say a little bit hidden while others offer a bunch of different services as well as shops and restaurants. Bounty Beach, Playa de Alicante, Nikki Beach, Playa Nagüeles are just a few beaches in Marbella area which need to be mentioned. Marbella is well known due to the crazy parties especially during the summer time. If you want to have the greatest and craziest night definitely head to Puerto Banus. It does not only provide you with the most exclusive clubs and posh restaurants but also allows you to enjoy luxurious yachts and cars “exposition”. Marbella is also super famous due to the annual music festival held during the summer. The festival is called Starlite Marbella and it is considered as one of the best cultural events in Europe. It attracts many famous singers and bands every year. Thus, if you are around Marbella between a middle of July until at the end of August, don’t miss this unique opportunity! Marbella is also considered as a paradise for golf, horse riding, tennis lovers. A dozen of magnificent facilities with amazing views will definitely satisfy the tastes of each one. We are sure that you are already looking forward to for your vacations in Marbella. Book dates, flights, place to stay and you are in!